We lost touch when people moved onto the Amigas. If anyone remembers me - please ping me. Hi ZZAP! That intro was on some of the best games ever! Exploding Fist! SCC rocks!! "Way Of The Exploding Fist" ist the best game ever on C64 for me.Hi SCC, your borders in this intro seem to be on LSD. Rockn´n Wrestle isn´t a game to remember but Way Of The Exploding Fist is a true all-time burner. It´s very cool to see famous players from the eighties still around.I appreciate your work. Greetings to Sweden and Germany. Grandpa greets from your old german friends after so many years. Let's see If I can find CPU. SCC was a synonym for fast! 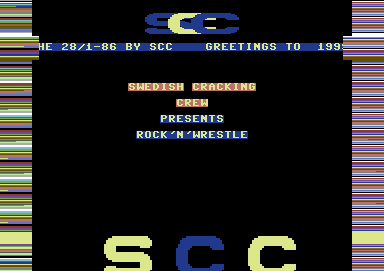 Rock'n Wrestle is from Melbourne House.They released oldschool classics like Gyroscope,The Hobbit and Way of The Exploding Fist.I loved these games.